Project 7. Have there been changes to bankside vegetation along our rivers? If so, and how have they affected water temperatures? River water temperature is strongly influenced by air temperature and shading. 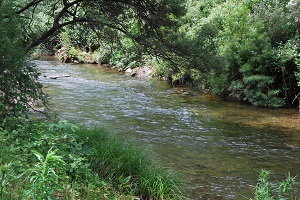 Improving shading through stream side vegetation may assist in maintaining the cooler water temperatures preferred by trout. Action: Work with CMAs to review the impact of changes in riparian shading on water temperature over time including changes to riparian vegetation e.g. bushfires and flooding, clearing and replanting. Assess the case for improving riparian habitat. How will this help? : This will assess whether changes in riparian habitat have occurred, whether they are a significant issue for wild trout fisheries and where there is scope to rehabilitate stream side vegetation.